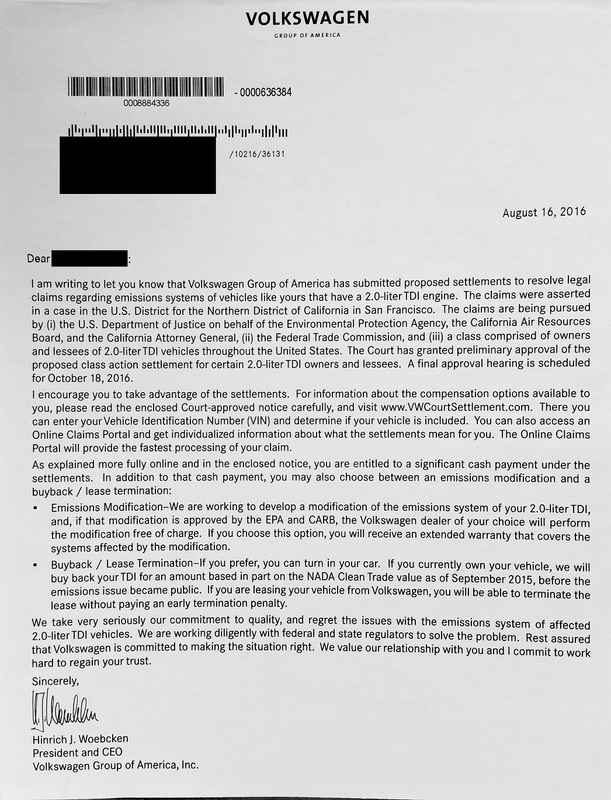 In August 2016, Volkswagen Group of America sent out thousands of letters with information about their proposed settlement to resolve the emissions systems claims on their 2.0-liter TDI engine vehicles. Owners of these cars were encouraged to take advantage of this settlement and submit their claim to receive a cash payment and also choose between an emissions modification and a buyback / lease termination. U.S. District Judge Charles Breyer will decide on October 18, 2016 whether or not to grant final approval to a tentative $14.7 billion settlement between Volkswagen, class action consumers and the federal government. As of the end of August, more than 200,000 Volkswagen owners and lessees registered to participate in the settlement; however, the proposed settlement hasn’t received equal praise as at least 15 different parties filed formal objections with the court. One of the complaints revolves around the attorney fees. The tentative settlement would require Volkswagen to pay “reasonable fees and costs” to the attorneys who represented the class-action plaintiffs, but a formal fee request hasn’t been made. The plaintiffs’ attorneys stated in an August court filing that they intend to seek no more than $325 million in fees from Volkswagen. That figure drew criticism from a number of parties, including Christopher D’Angelo, who filed one of the original complaints over the Volkswagen scandal. D’Angelo noted in his objection that the $324 million fee would work out to well over $15 million each for the 21 firms that make up the Plaintiff Steering Committee. Another common complaint was that Volkswagen could recover any money left in the compensation fund after the claims period ends, which is projected for 2018. One suggestion is that a “second round distribution” of funds be made to people who already made claims under the settlement. Any leftover funds after the second round could then be directed to the environmental remediation fund, which funds programs to reduce nitrogen oxides emissions and support adoption of zero emissions vehicles.